Business professionals from West and North Yorkshire have given Pudsey school pupils – and their parents – a valuable lesson in careers advice. More than 30 experts representing local employers and the armed services spent an evening at Fulneck School, talking about their own professions and the routes to securing employment. In addition, staff from the Universities of Leeds, Huddersfield and Bradford, and a number of higher education establishments, were on hand to talk about the courses they offer and the qualifications needed to access them. The sectors represented at this year’s careers convention included healthcare, science, engineering, banking, law, IT, performing arts, PR and marketing, and the armed forces. 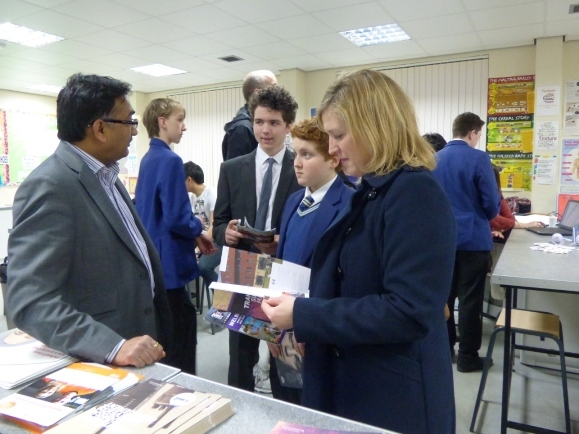 Deborah Newman, Fulneck School Principal, said: “We would like to say a big thank you to all the experts who gave their time to speak to our pupils and their parents. It was a very successful evening with more than 30 different sectors represented. Mrs Newman added: “Our role at Fulneck School is to equip our students with the necessary qualifications and confidence required to take them into the next stage of their lives.